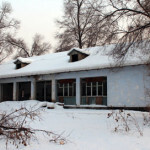 After reaching maximum capacity of the houses in the Village, we started thinking of the possibility of a new house in place of the ruined building left since the Soviet times. Some years ago a family from Italy, guests at the Ark Village on their honeymoon, decided to finance the education course of Nastja. An evening with friends, a cheerful game of Bingo and another project has been carried out at once.